ASG is in the business of keeping track of complex data. While they have a compelling story, the challenge came in telling it simply. ASG Enterprise Data Intelligence enables companies to rapidly trace, identify and ensure the quality of their data, eliminating gaps in understanding. Our challenge was to communicate that story in a way that was clear, memorable, and engaging. One of the best ways we’ve found of breaking down complex solutions is through the use of powerful, visual stories. We got to work concepting out various ways we could tell our client’s story through scripting, motion graphics, video, and iconography. Our team designed a fun, fresh “explainer” style video that broke down the complex ASG product story in a way that was easy to understand. 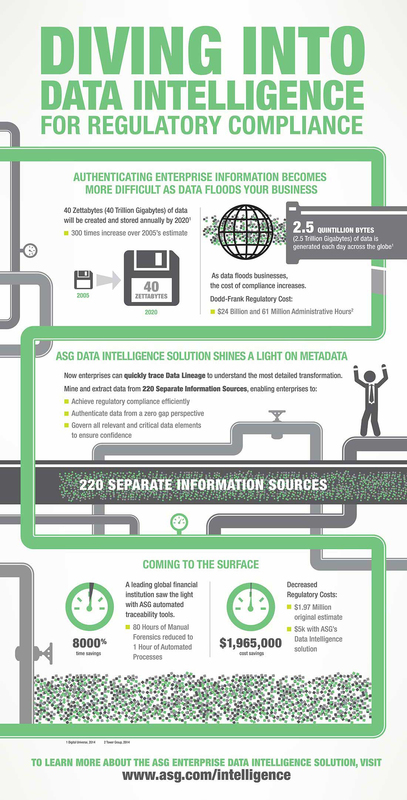 We also designed a static, supporting ASG infographic to promote the benefits of great data management. ASG loved the results. The video now lives front-and-center on the ASG Enterprise Data Intelligence webpage. The infographic has been shared broadly online, and is used to drive lead-generating traffic to the product website.